Becoming a nurse is a complicated process, as you may already know. Health-industry workers must have the best training and possess extensive knowledge from various fields in order to offer patients the best possible care. I’ll be presenting you with a list of comprehensive educational materials that are meant to prepare you for the HESI A2 Test and have you on your way to becoming a nurse. As you know, the HESI A2 Test requires the examinee to have mandatory knowledge of various concepts from different fields, such as mathematics, chemistry, biology, anatomy, English and more. This nerve-wrecking 5 hour and 15 minute exam is an important milestone for every person that’s aspiring to become a nurse, so you should prepare very thoroughly if you relate. Below, I have conducted a list of learning materials that are specifically written to aid you in passing the HESI Admission Assessment exams with flying colors. In the following review we’ll be covering products that you might stumble over while researching for books and products that I thought were perfect examples of how a Study Guide should be structured and written. Founded in 1880, Dutch company Elsevier has built a 137 year legacy in providing informative materials. Active in fields such as medicine, science and technology, this world-wide publisher is now responsible for providing both printed and electronic materials that will give readers a lot of reliable and precise knowledge relevant to the previously-mentioned fields. The HESI Admission Assessment Exam Review, 4e, along with the other materials I’ll be presenting you with, are all written in a way that will systematically address problems and explanations for each field that’s going to be present on the HESI Admission Assessment exam. I’ll be starting this review with a product that offers, in my opinion, the best value and the best structure and content for the money you’re paying. 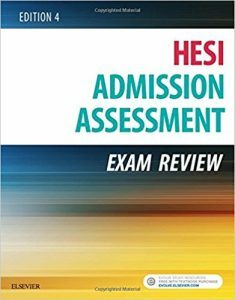 The overall best pick on the list (based solely on my opinion), the HESI Admission Assessment Exam Review, 4e will provide readers with a well-structured and comprehensive learning experience. It’s very important to mention that this learning material has been written by the maker of the exam, giving you that “insider” information at an affordable price. Because of the way it's been written, the HESI Admission Assessment Exam Review, 4e, will have you asking questions before diving into the actual tests in order for you to better assess where your strengths lie and improve where you see fit. The 160 pages of questions and practice tests are more than enough to prepare you for one of the biggest steps you’ll be taking for your future career. The three full-practice tests and the 50 post-test questions will polish your science, maths and English notions in no-time. Although not the cheapest option on the list, the Assessment Exam Review, 4e offers, by far, the best value, and its drawbacks are very limited. Well, to be honest, just one drawback: it features some print errors that won’t, in any way, negatively impact your learning process. Published under Trivium Test prep, a company that’s focused on offering informative materials for future college students, this next study guide I’ll be covering is already a safe pick. Trivium Test Prep is a publisher that focuses on writing well-researched study guides for a big number of exams, ranging from the COMPASS to the PERT exams. Seeing as the publisher always respects a solid format when releasing new guides, the formula it applies to all of its study materials has proven to be infallible and successful throughout the years. Let’s face it - it’s a guide that’s written with great attention to detail, a guide that will carefully tackle problems, step by step, and will address every area that you need to cover in your future HESI A2 exam, giving you in-depth explanations and definitions for the new concepts that you’ll be required to learn before starting your education. What’s important to mention is that the HESI A2 Study Guide will mainly be focusing on the information, putting the test in the background (although it will still cover the test itself). When purchasing the HESI A2 Study Guide, you’ll be getting one full practice test. Whether or not this guide is for you, that’s not for me to decide. In my opinion, this is a great learning material, and I’ll tell you why: It’s not only preparing you for a test. It’s frustrating to see how many learning products are only focusing on the test, ignoring the learning process to a great extent. I remember that I extensively used practice tests to practice for my college exam and when I actually took it, 60% of the subjects that were present on my exam sheet weren’t covered at all by the test books I’ve used. It’s important for a study guide to focus on the information more than the test, and this guide does just that. 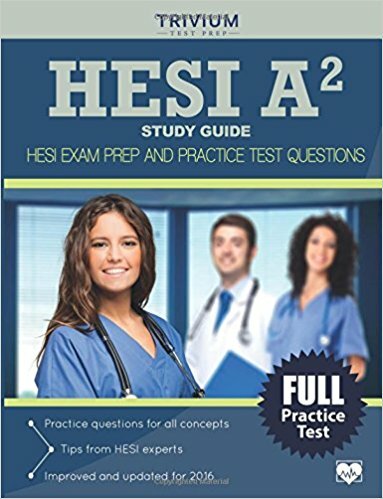 Even though it offers only one practice test, I’m pretty certain that the test you’ll be taking from this guide will be very close to the real HESI A2 exam. While this is a great overall guide, it seems that print errors are a fairly common problem with these types of materials (although I can’t explain this phenomenon). Again, the HESI A2 Study Guide will contain some typos and misprints, but these won’t affect the learning process. Now that we’re well in the middle of the review, you’re probably starting to see a pattern. Our next product is produced by yet another education-oriented publisher, Mometrix. From what I can tell, Mometrix is one of the largest publishers that focus on study guides and flashcards. You’d be impressed to see how many materials Mometrix has released over the years, obtaining invaluable experience in the industry that will reflect on the quality of its products. I won’t continue to bore you with specifics regarding the publishers. Instead, I’ll focus on their HESI A2 Secrets Study Guide, a standard educational book written for the sole purpose of training you to pass the HESI A2 exam. While it’s pretty similar to the other books I’ve mentioned on the list, it’s got some tricks up its sleeve, and I’ll be revealing them shortly. The 222 pages of information, paired with a conclusive practice test, will get you on the right track to becoming a nurse. 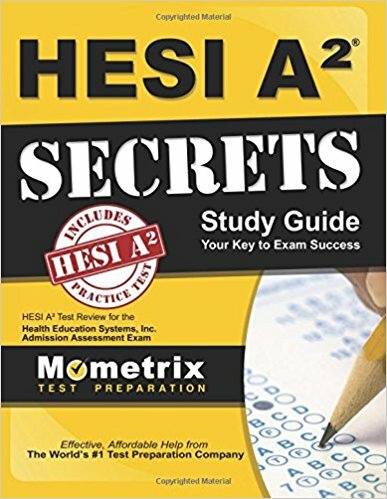 The HESI A2 Secrets Study Guide comes with one full practice test. The HESI A2 Secrets Study Guide is a comprehensive guide for the HESI A2 exams, offering in-depth explanations for all of the topics that you’ll be facing when applying for a school. What’s neat about this one is that it offers you tips and tricks on how each section is conducted, giving you an engaging and dynamic learning process, which is very important in keeping you constantly motivated during your studies. Another feature that gives this pick an edge over the previously-mentioned guides is the fact that, by purchasing this guide, you’re unlocking video lessons offered by the Mometrix Academy, a recent feature implemented by the publisher. While I’m no expert, I’m pretty certain that video lessons offer you a better learning experience because the information is presented and explained to you in higher detail. 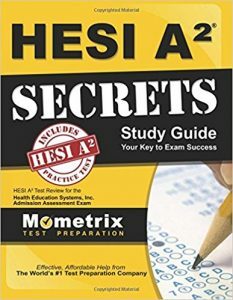 Although the HESI A2 Secrets Study Guide is a great choice, the fact that it's lacking in the vocabulary sections can make it inferior to our previously mentioned products, although it shouldn’t reflect on the overall quality of the guide which can be very useful if you already have a good grasp over these core concepts. If, during your research for educational materials, you’ve stumbled, by chance, on this Hesi A2 Study Guide, you’ll notice that the publisher isn’t mentioned anywhere. The fact that this product is independently published seems kind of shady, as the HESI A2 exams are a milestone in the lives of aspiring nurses and training guides for these exams should be carefully written and edited by professionals with experience in the educational field. Although I’m not saying that you should dismiss this product entirely, this is the first guide that we’ll be covering by starting with one of its drawbacks. Publisher aside, the guide isn’t too bad. It still gives valuable information regarding the sections that will be covered in the tests and throughout its 194 pages you’ll be finding a lot of helpful explanations that will be useful in preparing for the HESIs. 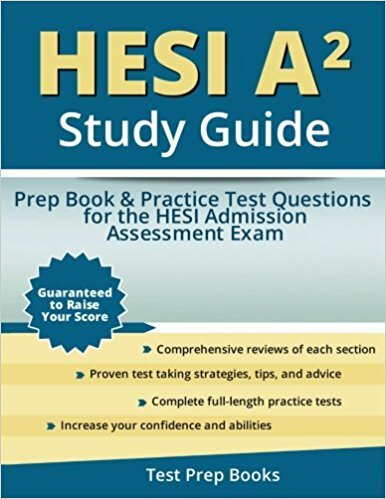 The HESI A2 Study Guide comes with 2 practice tests. What’s nice about this guide is that it’s pretty concise and on-point when it comes to the information it offers. You won’t see a lot of fluff in its 194 pages, and fluff content can be a bit distracting, although it can offer you a bit of a “mental break”, so you decide if that’s helpful or not. Another thing that’s nice, but not unique, is that the two practice tests it features will be very similar to the real test you’ll be taking, getting you well-prepared when answering the real questions. That being said, the drawbacks are bigger and have a more negative impact on the content when compared to the previously-reviewed products. The structure of the sections is all over the place - you’ll constantly find yourself struggling to find information that’s very awkwardly placed. Even worse, this guide features 0 illustrations, making it very bland and hard to follow, which was already an issue to begin with. Wrapping up our review, I’ll be featuring a different studying tool compared to what we’ve previously dissected. Another “unknown publisher” manual, this one doesn’t seem as shady as the guide we’ve discussed before. Instead, this is a pleasant surprise. Even though the HESI A2 Practice Tests 2016 doesn’t have any publisher to back it up, users are overall pleased with the product. This isn’t a guide, it is (as the name implies) a test book. It features over 800+ questions and answers that are similar to the ones you’ll be confronting on the actual HESIs. The HESI A2 Practice Tests 2016 is also the cheapest book on our list. When buying the HESI A2 Practice Tests 2016, you’ll be getting 800+ questions with answers and detailed explanations. What’s nice about this book is the fact that you can use it to further test your knowledge after studying from a proper guide. 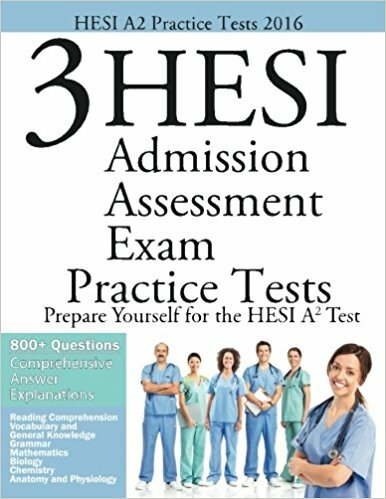 The 252 pages of questions will be enough to paint the picture for the coming HESI Admission Assessment exam and will give you more confidence when confronted with the real deal. You should consider buying this in addition to one of the guides I’ve previously mentioned, as it’s best used under those conditions. Hopefully, this list will give you some materials that will be helpful in your journey to becoming a nurse. 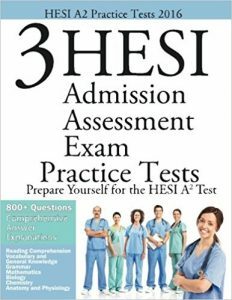 Buy one, two, or each and every one of them, they’ll still provide helpful information and prep you for the HESI Admission Assessment exam. Remember, practice makes perfect - don’t underestimate the use of these Study Guides.